Experience the illumination for yourself! For the first time! Origins Mini-Facial comes with a unique jade tool that compliments Mega-Bright, giving you instantly radiant complexion; as if your skin is 'lit from within'! Book today! It's FREE, and available at all Origins stores nationwide! You can just call up any of our store to make a reservation for your preferred timing. The Mini Facial is available everyday! 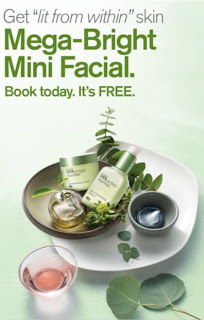 And the great thing is, there's no expiry date for this Origins Mini Facial program! For full store listing and phone number, check out the Origins Store Locator link in their facebook page.